Tiger Set To Place His Stamp On Hawaii! Tiger Set To Place His Stamp On Hawaii! Tiger Set To Place His Stamp On Hawaii! Tiger Woods has been commissioned by Pacific Links International to create one of golf’s finest and most sought-after golf destinations. 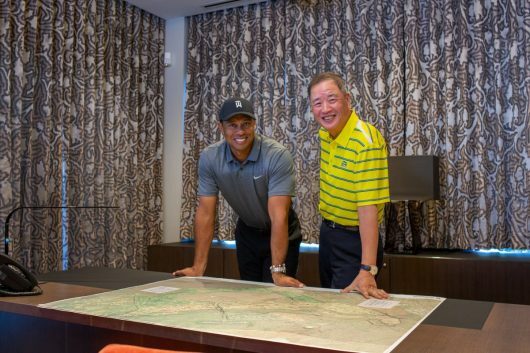 Tiger Woods and his TGR Design company have unveiled plans for one of two spectacular golfing layouts to be created at Mākaha Valley Resort, Hawaii. Inspired by the pristine setting on Oahu’s Leeward Coast, TGR Design will lead the development of the Mākaha North Course, while Gil Hanse, creator of the Olympic Course in Rio de Janeiro, will develop the Mākaha South Course. Together, these world-class, tournament-quality layouts will become the centre pieces of the Mākaha Valley Resort, a 644-acre mixed-use property developed in conjunction with community leaders and native cultural practitioners on Hawaii’s third-largest island. “At TGR Design, we focus on finding spectacular locations to design distinct and memorable golf courses. The Mākaha Valley on the west coast of Oahu is truly one of these unique and special locations. The cathedral-like setting of the property is framed with big ocean views to the west and towering mountains to the east. We are designing a golf course that will take advantage of this spectacular setting yet still be fun and playable for golfers of all abilities,” commented Tiger.